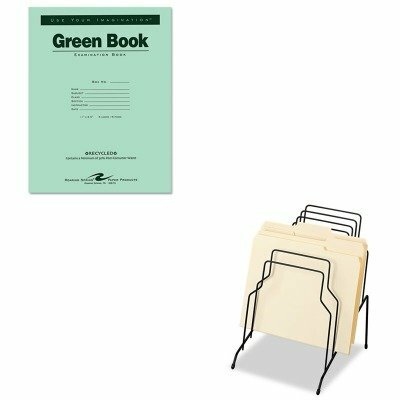 KITFEL72614ROA77509 - Value Kit - Roaring Spring Green Books Exam Books (ROA77509) and Fellowes Step File (FEL72614) by Roaring Spring at LDP Graphic Design. MPN: FEL72614ROA77509. Hurry! Limited time offer. Offer valid only while supplies last. lt;stronggt;ROA77509lt;/stronggt;lt;BR/gt;Roaring Spring Green Books Exam Bookslt;BR/gt;Eight sheet, 16-page exam books with stapled construction. lt;stronggt;ROA77509lt;/stronggt;lt;BR/gt;Roaring Spring Green Books Exam Bookslt;BR/gt;Eight sheet, 16-page exam books with stapled construction. Wide rule with margins. Pad Type: Exam Sheet Size: 8 1/2amp;quot; x 11amp;quot; Ruling: Wide.lt;BR/gt;lt;BR/gt;lt;stronggt;FEL72614lt;/stronggt;lt;BR/gt;Roaring Spring Green Books Exam Bookslt;BR/gt;Stepped sections for easy viewing and quick access to folders, letter and legal size papers. Wire design with rubber-tipped feet. Desktop File Folder Sorter Type: Inclined File Sorter Number of Compartments: 8 Materials: Wire.